WASHINGTON, D.C. -- Forty-one percent of Americans strongly disapprove of the job Donald Trump is doing as president, and 26% strongly approve -- almost exactly the same percentages as Gallup found 15 months ago, in the first weeks of his presidency. Do you approve or disapprove of the way Donald Trump is handling his job as president? Do you approve/disapprove strongly or only moderately? The parity in strong opinions between the two periods parallels similar levels of overall approval, with 42% approving and 53% disapproving in the 2017 poll and 42% approving and 54% disapproving today. The majority of those who approve and of those who disapprove of Trump say they feel strongly about their opinions, but more who disapprove do so strongly (by a better-than 3-to-1 ratio, 41% to 13%) than is the case for those who approve (less than a 2-to-1 ratio, 26% to 16%). A total of 67% of Americans have intense feelings about the president -- either strongly approving or strongly disapproving of Trump's job performance. Only three other presidents -- George W. Bush, Bill Clinton and George H.W. Bush -- have evoked more intense reactions from the public since Gallup first measured strength of presidential approval and disapproval in 1965. Though the current approval and disapproval numbers are nearly identical to those of the February 2017 poll -- the only other time Gallup has asked about strength of approval and disapproval since Trump took office -- his overall approval ratings have been lower for most of the past 15 months. The approval rating reached a low of 35% four times in 2017, but it has been climbing in recent weeks. The percentage of Americans who strongly disapprove of the job Trump is doing is one of the highest for any president in the history of the Gallup "strongly" question, which has been asked 82 times at irregular intervals. Forty-three percent said they strongly disapproved of the job George W. Bush was doing in December 2005, less than a year into his second term, and 44% strongly disapproved in a poll less than three months later. The question was not asked over the remaining three years of his term in office -- a period during which his overall disapproval rating reached as high as 71%. Strong disapproval of Richard Nixon reached 41% in August 1973, in the midst of nationally televised Senate hearings on the Watergate scandal. By February 1974, 48% strongly disapproved, and in an Aug. 2-5 poll that year, less than a week before Nixon resigned, 46% said they strongly disapproved. Though most of the presidents whom Gallup has measured in this way have had at least one strong disapproval rating above 30%, these readings were relatively rare (with the exception of Nixon) before the George W. Bush presidency. Presidents Lyndon Johnson and Gerald Ford never reached 30%. Jimmy Carter's strong disapproval ratings were below 30% in 16 of the 17 times they were measured, as were Ronald Reagan's in six of eight measurements and Bill Clinton's in six of nine. That pattern has reversed itself, however, in the last three presidencies. Thirty percent or more have disapproved strongly of Bush, Barack Obama or Trump in all but one of the 16 times the question has been asked. That single time came in early October 2001, as the country rallied around Bush in the weeks after the Sept. 11 terrorist attacks. The 26% who strongly approve of Trump in 2018 is one percentage point above the historical average; the 16% who somewhat approve is well below the historical average of 25%. The intensity of Trump approval and disapproval among Republicans and Democrats is nearly identical to what it was more than a year ago. Sixty-six percent of Republicans now strongly approve of the job Trump is doing, and 5% strongly disapprove. In Gallup's February 2017 poll, conducted about a month after Trump took office, 65% strongly approved and 5% strongly disapproved. In the 2017 poll, 75% of Democrats strongly disapproved and only 4% strongly approved. Now 77% strongly disapprove and 3% strongly approve. The high percentage of strong disapproval among Democrats, like the increase in overall strong disapproval numbers, represents a trend that began with George W. Bush's presidency. Previously, the percentage of those in the political party not occupying the White House who disapproved strongly of the president reached as high as 60% on only one occasion -- in February 1974, immediately after the House had voted to investigate whether to impeach Nixon. Since George W. Bush's election, the percentage of the opposition party who strongly disapprove has been below 60% only twice in 16 measurements -- in the first year of the Bush presidency and the first year of the Obama presidency. Opinions about Trump's performance as president are strong and stable, as evidenced by the limited variation in his ratings thus far and the lack of change in the intensity of opinions about him compared with February 2017. His overall approval ratings have varied less during his first 16 months in office than those of any president in Gallup's records -- but Nixon's, Johnson's, and John F. Kennedy's ratings were about equally as stable. The percentage who strongly approve of Trump has moved only one point since it was last measured in February 2017, and the percentage who strongly disapprove has not moved at all. It is no shock that Americans had already formed strong and fixed opinions about Trump before he took office. He had been a controversial figure in the public limelight for more than a quarter of a century -- Gallup asked about him as far back as 1989, when a majority expressed skepticism about his honesty. Because opinions on Trump are long-standing and strongly felt, it is likely that major events and developments will tend to affect his approval ratings less than they have for most previous presidents. 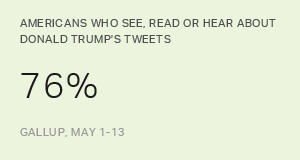 Results for this Gallup poll are based on telephone interviews conducted May 14-20, 2018, on the Gallup U.S. Poll, with a random sample of 1,513 adults, aged 18 and older, living in all 50 U.S. states and the District of Columbia. For results based on the total sample of national adults, the margin of sampling error is ±3 percentage points at the 95% confidence level. All reported margins of sampling error include computed design effects for weighting. 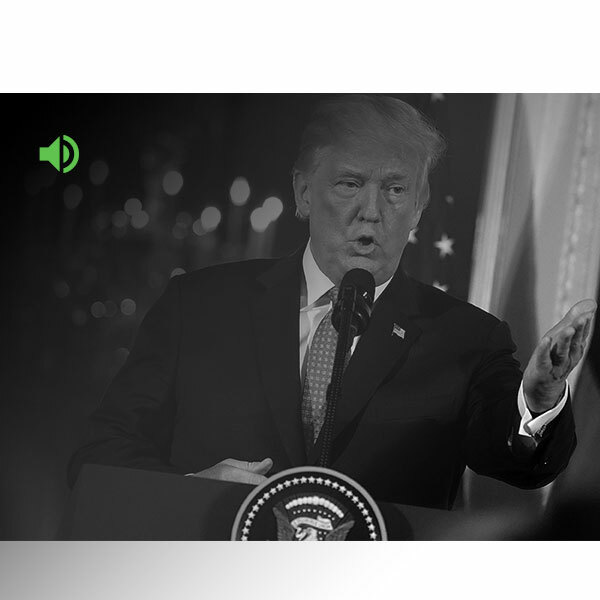 While many Americans hear about Donald Trump's tweets, most are getting the information through indirect or filtered means, not directly from the tweets per se.